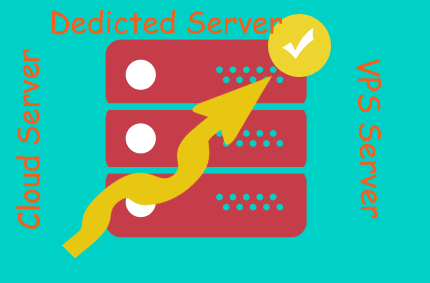 The accuracy and pace of website running depending on the server one have chosen. There are some options of web hosting, one can choose such as Dedicated, VPS (Virtual Private Server), Cloud Hosting. In this hosting server, each website is hosted on a virtual private server with robust hardware. In this, each website is split into different virtual compartments and server software is established upon them differently, turning every unit capable of functioning separately. Hence, though other websites may get hosted on the similar physical system, yours will be the only website that will host in virtual compartment given to you. This will help your website not to be disturbed by the working/performance of other machines. Hence, this server helps you to give exactly what you pay. In this, you can experience the utmost control of your website because you can exclusively get the entire rented server. It means only your website will be stored in it. In this, users can experience unlimited capability to handle high traffic. On this server, a team of servers known as a cloud work collaboratively to host a group of websites. This endows multitude of computers to work collaboratively to handle high traffic levels for any particular website. Moreover, for using this hosting, the users should note that how much they want to spend on cloud hosting like $30 or above because cloud hosting users are charged according to per usage basis.  Does your website require special software?  How big (or small) can the web traffic volume go?  Have to plan to host on multitude websites on the same hosting account?  Is security a core area for your website?  Do you require a server root access?  Do you require to install your own application and software?  Do you require a dedicated IP for your site?  Is private SSL certificates required?  Do you require Windows applications?  Does your website require a special version of the software (i.e. PHP)?  How fast do you wish to have your hosting server? Apart from these, you may concentrate on other questions prior to final your hosting server so that the end results would be best. if you confusion live chat with any time.